A weather station on Granite Island, Lake Superior. 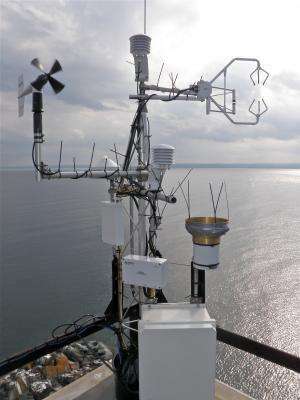 This weather station is part of a five-site network to measure year-round Great Lakes evaporation. In addition to evaporation, the weather station measures air temperature, relative humidity, barometric pressure, carbon dioxide, wind speed and direction, precipitation, solar radiation, and water temperature. Credit: John Lenters. The recent Arctic blast that gripped much of the nation will likely contribute to a healthy rise in Great Lakes water levels in 2014, new research shows. But the processes responsible for that welcome outcome are not as simple and straightforward as you might think. Yes, extreme winter cold increases ice cover on the Great Lakes, which in turn reduces evaporation by preventing water vapor from escaping into the air. But this simplistic view of winter ice as a mere "cap" on Great Lakes evaporation is giving way to a more nuanced conception, one that considers the complex interplay among evaporation, ice cover and water temperature at different times of year. In a report released today by the Great Lakes Integrated Sciences and Assessments Center (GLISA)—a federally funded collaboration between the University of Michigan and Michigan State University—a team of American and Canadian scientists notes that while ice cover affects evaporation, the reverse is true as well: evaporation rates in the autumn help determine the extent of winter ice cover. High evaporation rates in the fall can nearly offset water-level gains that result from extensive winter ice cover, complicating efforts to forecast Great Lakes water levels, which have declined in most of the lakes since the late 1990s, rebounding somewhat during a wet 2013. The newfound appreciation for evaporation's varied roles reveals gaps in our current understanding of fundamental environmental processes and highlights the need for sustained funding for the project's Great Lakes evaporation monitoring network, said John Lenters, the study's lead investigator and a senior scientist at Ann Arbor-based LimnoTech, an environmental consulting firm. The binational group's network of five stations is one of the few sources of direct, year-round observations of Great Lakes evaporation. "It's our hope that we will soon have the funding and infrastructure in place to maintain—and even expand—the network well into the future," Lenters said. "This will be extremely important for improving Great Lakes water-level forecasting and for understanding the long-term impacts of climate change." The study by Lenters and his colleagues is the first coordinated effort to study evaporation across the Great Lakes. In addition to Lenters, the research team consists of Christopher Spence of Environment Canada, Peter Blanken of the University of Colorado, John Anderton of Northern Michigan University and Andrew Suyker of the University of Nebraska. 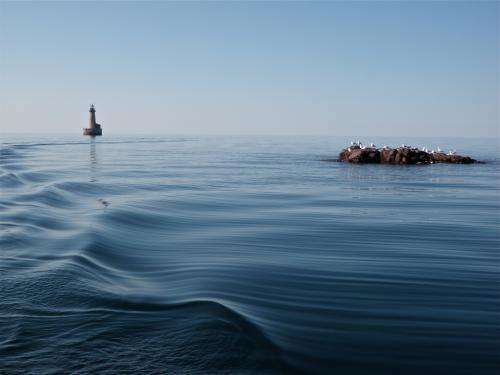 Stannard Rock Light, Lake Superior. The lighthouse hosts one of five year-round Great Lakes evaporation monitoring stations. Credit: John Lenters. By piecing together the results from several studies, Lenters and his colleagues showed that years with high Great Lakes ice cover require a large amount of heat loss from the lakes in the preceding autumn and early winter to cool the water enough to form ice. And one of the most effective ways for a lake to lose heat is through evaporation, which means that extensive ice cover is actually an indicator of high evaporation rates prior to a high-ice winter, according to co-author Blanken. Team members used funding from a 2011 GLISA grant to integrate their independent efforts, underway since 2008, to monitor and understand the impacts of climate variability and change on Great Lakes evaporation. The 11-page white paper released today highlights a few of the results. "No two years are alike when it comes to Great Lakes evaporation, ice cover and water temperatures, but the recent documented changes in the lakes' water balance are aligned with predictions associated with climate change," said Environment Canada's Spence. "That's why these new measurements over each of the Great Lakes have been so valuable to better understand these seasonal, inter-annual and long-term variations," he said. The recent cold spell, blamed on an errant polar vortex, provides a striking example of how Great Lakes evaporation sometimes defies expectations. While examining meteorological data from an island on Lake Superior, Lenters found that evaporation rates during December 2013, a cold month, were about 60 percent higher than they were in December 2011, a much warmer month. "Most people would find this counterintuitive," Lenters said. "Why would a lake evaporate more rapidly during a colder month? The answer, it turns out, lies within the lake itself." Relative to the air, December and January water temperatures can be surprisingly warm in deep lakes like Superior. In early January 2014, the lake was 30 to 40 degrees warmer than the overlying air, according to Lenters. That large temperature contrast caused a steep moisture difference which, in turn, led to high evaporation rates, he said. So what does all this mean for Great Lakes water levels in 2014? Although the recent cold spell has led to high evaporation rates this winter, the extensive ice cover is likely to stick around longer into the spring than is typical. That may lead to cooler summer water temperatures and a later start to the 2014 Great Lakes evaporation season. "Together with high spring runoff from this winter's heavy lake-effect snowfall, it would be reasonable to expect a healthy rise in Great Lakes water levels this year," Lenters said. In addition to funding from GLISA, the investigators received support from the International Upper Great Lakes Study through the International Joint Commission. The co-directors of GLISA are Don Scavia at U-M and Thomas Dietz at Michigan State University. "A new understanding of the impacts of climate variability on Great Lakes evaporation is emerging as a result of this GLISA-funded project," said Scavia, director of the Graham Sustainability Institute, which oversees the GLISA program at U-M.
"In light of these new findings, continued long-term monitoring of Great Lakes evaporation and related hydrological processes is paramount for understanding and predicting the future impacts of climate variability and change on Great Lakes water levels." "Understanding how lake levels are changing is very important to our region," said Dietz, a professor of environmental science and policy at Michigan State. "This affects shipping, recreation and infrastructure on the lake shore."